Rae Snider, ‘17, graduated from William Jewell College with a major in English and a minor in women’s studies. Though she hadn’t planned on working in the nonprofit sector she is now active in the field in Kansas City. Despite this, Snider is still successfully working for a nonprofit. She began working in resource development at KC Mothers in Charge, a nonprofit that focuses on helping families of homicide victims in the Kansas City metro area and violence prevention, in June 2018. Snider writes grants for the nonprofit and has also taken on some other office tasks. “It includes a lot of donor management and relationships with donors, so just making sure that they know we appreciate them and making sure they get their tax receipts and tax deductions,” Snider said. She feels that her time at Jewell helped prepared her to write grant proposals – an important source of funding for any nonprofit. KC Mothers in Charge recently received a $5,000 grant. It was the first grant that Snider had worked on. She spoke of what a proud moment that was for her. Snider says the grant writing process is very different from what she had expected. Funders come in the form of different foundations. Some of these foundations are wealthy families and others are businesses. Snider believes that communication with funders is a vital step towards receiving a grant. Working for KC Mothers in Charge is a way for Snider to combine her writing skills with her passion for helping people. Mothers in Charge was started in Philadelphia by a mother who lost her son to homicide. The Kansas City chapter was established in 2014 after Rosalyn Temple, executive director of KC Mothers in Charge, lost her son. 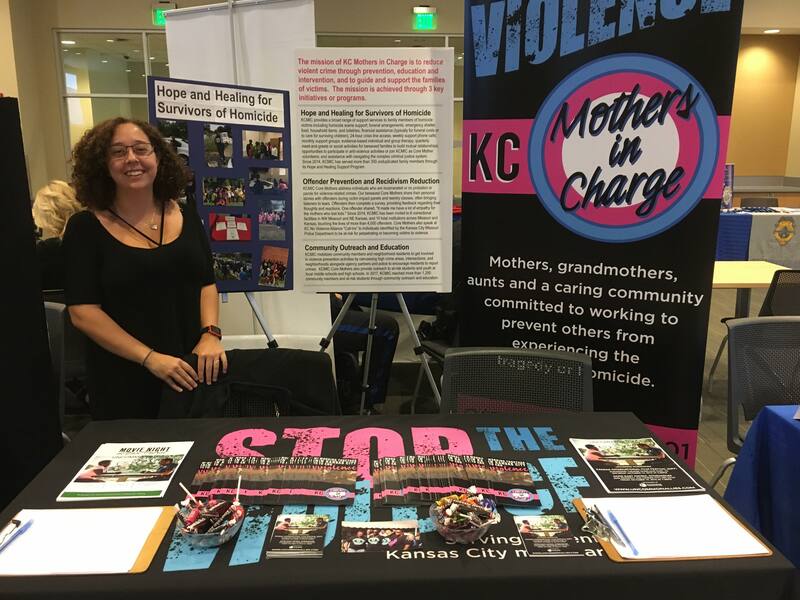 Snider represented KC Mothers in Charge at the University of Missouri Kansas City criminal justice career expo, Oct. 17. Anytime there is a homicide in the Kansas City metro area the Kansas City Police Department dispatches a “Mother” – a woman from Mothers in Charge who has lost a child to homicide – to the scene. They help families through their grief and can provide financial and emotional support. “They help them with the funeral, they help them understand why it takes so long to hear back from the police or hear back about an autopsy. We can also help financially with funeral assistance or if they need food,” Snider says. The organization also focuses on proactively preventing violence. There were 149 homicides in Kansas City in 2017. Fifty-eight percent of those homicide victims were African American males. There have been 112 homicides this year – down from 126 at this point last year. Speaking to the family members of these victims is something that makes an impact on both the family and the employees. Snider’s advice for Jewell students wanting to go into a career in the nonprofit sector is to take advantage of the Nonprofit Leadership Association and to have an idea of how your skills and interests fit in with nonprofits. Working for a nonprofit is a great way to both make a living and earn benefits worth more than a salary. Snider spoke about this balance.